BindingNavigator control is basically used for Binding the Database values to the control (Text Box,label etc. 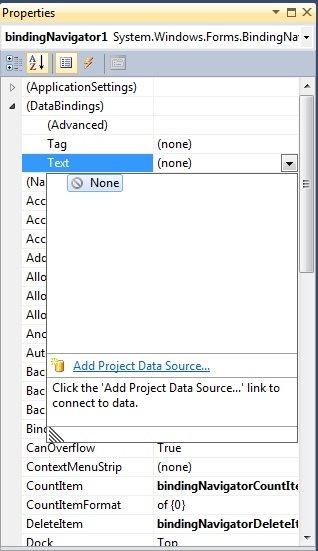 ).In this tutorial ,i am going to bind the Text Box control Data at Run time using BindingNavigator control.Here I am using Microsoft Sql server Database .You can Use any Database for this binding. Step : 2 Now open SQL Server Management Studio-->Create a table(student) and insert some values also. Step : 4 Now click Add Project Data Source which is shown above image. Step : 5 Now select Database and click Next Button. Step : 6 Now select Dataset and click Next button. Step : 7 Now click New Connection Button -->Select Server Name-->Select or enter database name -->Click Text Connection Button-->OK. Step : 8 Now click Next Button. Step : 10 Now Go back your Form --> go properties of Sid Text Box -->Expand DataBindings --> Text --> double click on Sid column-->same way follow for Name and Age also. Step : 11 Now go properties of the BindingNavigator control--> Select BindingSource. Step : 12 Now Run the Application(press F5). Insert Data in SQL Server.